Your leads pour in from a variety of sources—online forms, purchased lists, referrals and cold calling. But how do you manage and make the most of your leads? And how do you track leads as they become opportunities? For most companies, managing and tracking leads in a consistent way remains a key business challenge. 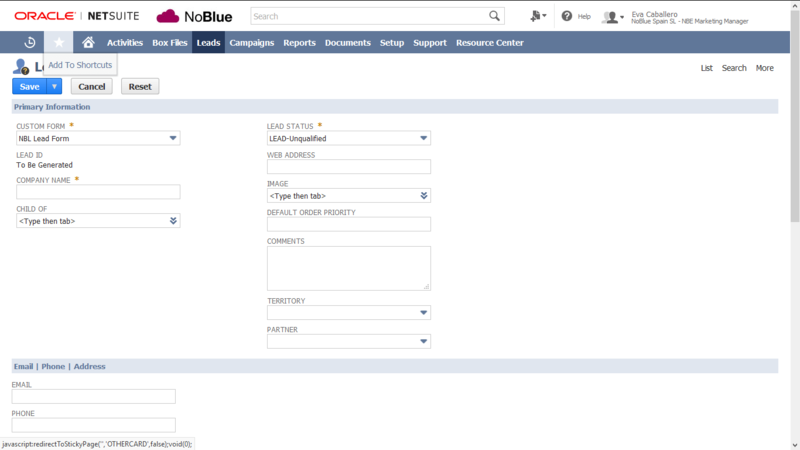 With NetSuite CRM+, you have multiple ways for lead entry, including online forms that allow you to capture leads directly from your Website; CSV and XML import capabilities that detect duplication when using purchased lists; and manual entry for leads obtained through cold calling and referrals –(see below how to create new leads). NetSuite’s CRM products also let you customise your lead qualification and scoring process in a way that’s most meaningful to your business, but also customisable to different views depending on what department is managing data. As NetSuite CRM understands both ‘Company’ and ‘Individual’ customers and the associated record types, it enables you to segment these and market on the attributes and habits of the appropriate end customer, or even distributors (partners). You can also track distinct factors for your pipeline management, such as expected weighted sales by product/service, track likely resource and purchasing requirements by adding these views very simply into your reporting and planning. 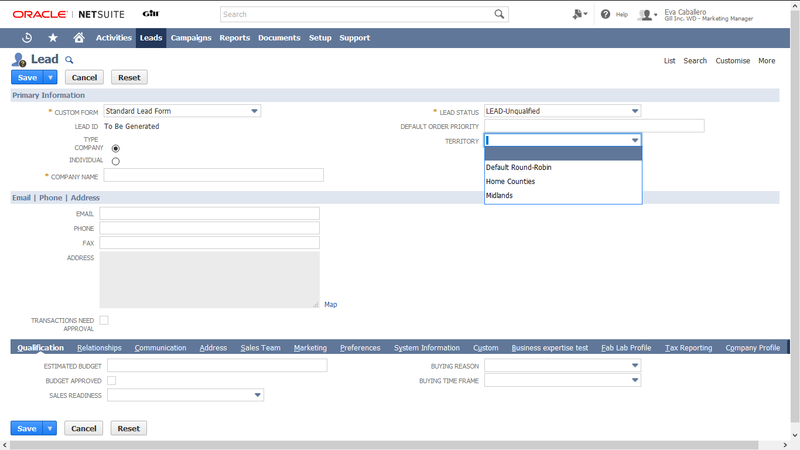 You can also create custom fields to tailor NetSuite CRM+, but before doing it is important to map your business processes and ensure continuity of data throughout the process. Without the correct workflow tailoring CRM may result in a mess useless both for sales and marketing and thus, not adding value for the company. If you configure this field as “default lead type = person,” the leads are non-qualified contacts that your sales team should qualify and “convert” into companies (which convert into prospects and clients), as in any traditional CRM. If you configure the field as “company”, then the leads will be the companies, and the contact persons will be nested to it by default. These “business leads” will evolve to prospect and client, but without the first step, which would be “lead as a person to qualify”. In this way you are qualifying companies and the contacts within them. As advised, you can hold both types of records, including managing parent-child group relationships, or even family members. Great, but where do I find the CRM? 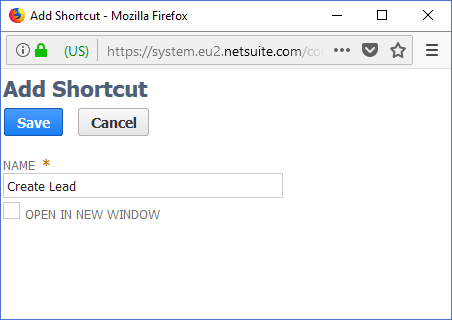 The first time I faced a NetSuite screen and I was wandering around the application I did not know how to find it. It is as simple as going to: “Lists> Relationships” and there we will find Leads, Prospect, Clients and Contacts. As we said earlier, before creating custom fields it is important to carefully map your business processes, you can figure out data your organization needs to capture in order to optimise CRM. This could be a field in the customer relationship management (CRM) module that captures something about your customers only your business might need, but it also applies to any module, such as custom fields in your inventory or accounting modules. Adding one or more of these custom fields to your records isn’t difficult. 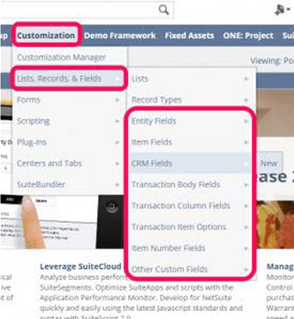 To get started, go to Customization > Lists, Records, and then Fields. From there, select [Custom Field] > New, and then indicate where the [Custom Field] should go and what the desired field type is. 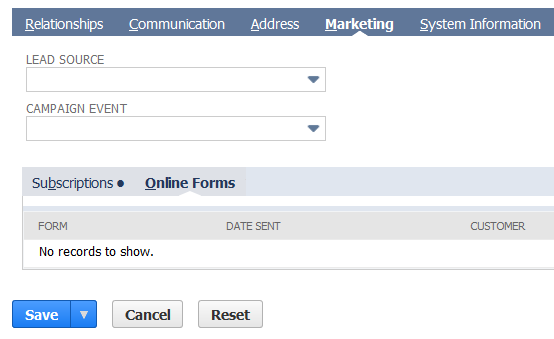 (However, you can, subject to your permissions edit a form/record directly out of itself). You can add different types of fields, which may be a dropdown selection (customer preference selection for interest is a good example), integer based record (such as RFM), Free from text, additional email fields (with validation), are a few samples. Note that there is a tab called “Display”. It’s where you can instantly add the Entity field so that your team can see and use it. It is important to pay attention to the options “Insert Before” and “Subtab”. If you choose to add the field to a sub-tab, it will appear below the main fields, where the rest of the tabs are, at the bottom of the screen of each record. By default, your name is selected as owner for this field and only the owner can modify it. Enter a description of the field. In the Type field, select the kind of custom field you want to create. The type of field you select determines the other options you can set on this page. If you have chosen List/Record or Multiple Select in the Type field, then select the list or record that contains the items for the list field. Also by default, the Store Value option is enabled so that custom field values are stored in your Oracle NetSuite CRM+ account. Clear this box to indicate that this custom field’s values are “display only” and should not be stored. Also, some custom field data types provide a “Use Encrypted Format” option you can enable to encrypt the field values stored in the database. Ok, but now, how do I create a lead? A standard lead form will open. 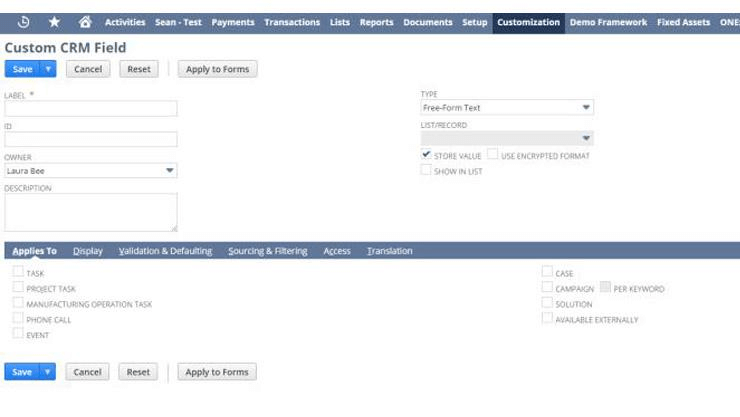 Lead forms are customisable, and each field can be changed both in terms of name and information captured. You may also add a quick add dashboard tile if appropriate. 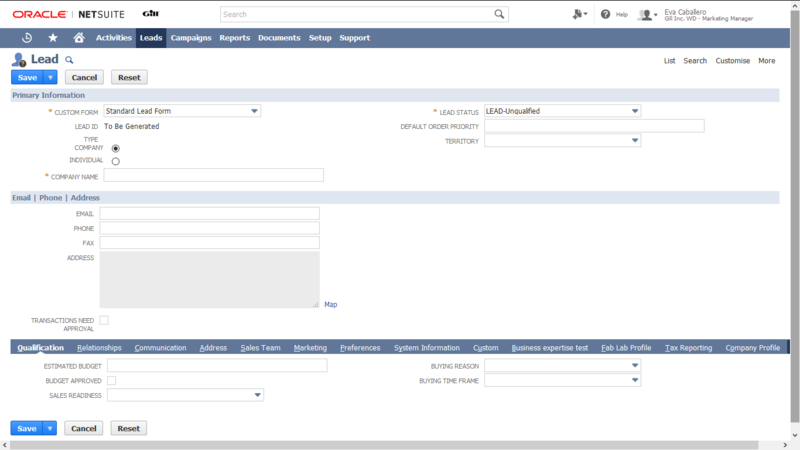 Once in it, to complete it, you simply have to select and populate the fields. You can make certain fields mandatory (they will be marked with a red asterisk). 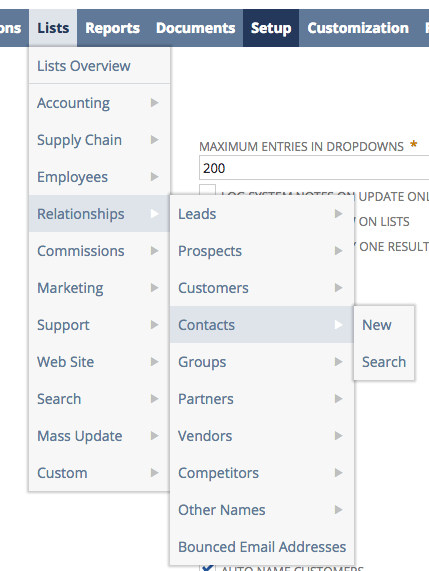 If you usually manage leads, it can be useful to add a shortcut to your dashboard. This same procedure applies to any recurrent task you want to show in there. Shortcuts allow you to go directly to the specific task or procedure you want, saving time going through the menu/submenu tabs to get to your objective. A pop up will appear, where you can re-name it to be more descriptive, something quite helpful if you have many shortcuts. 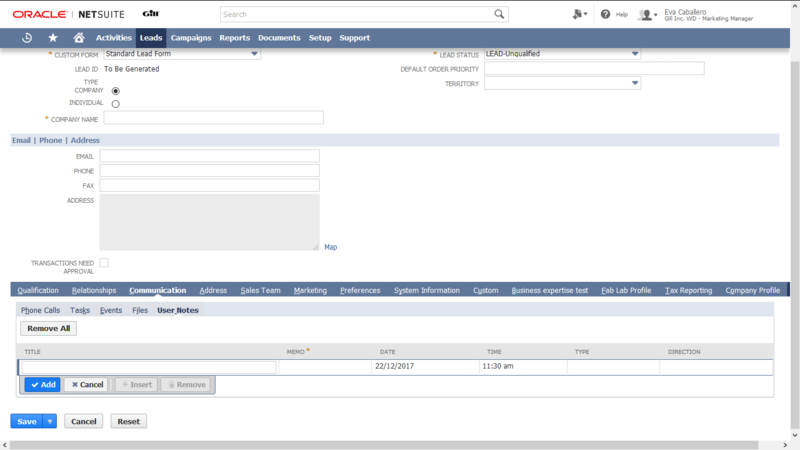 Want to know more about NetSuite CRM+? Contact us and let us show all the features and possibilities it can add to your sales and marketing management, and thus improving performance for your company. As customer relationship management (CRM) becomes more complex, it’s becoming more important than ever to integrate your key business processes. 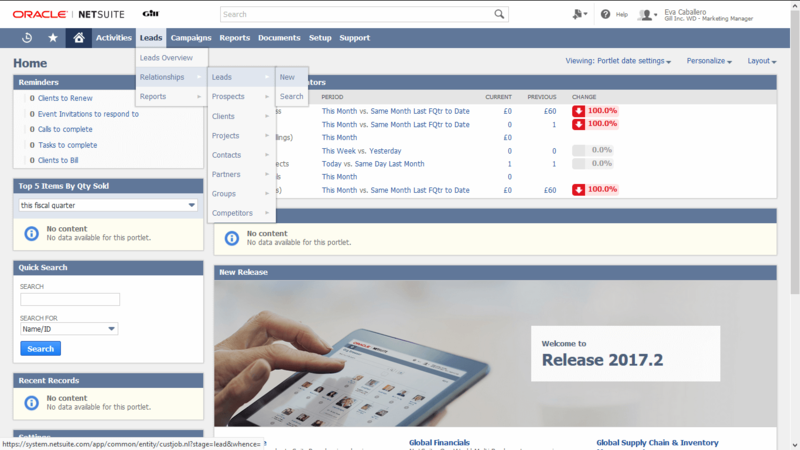 So you want a simple CRM system? Are you sure?